The Half Pass is when the horse moves diagonally forwards with a small amount of flexion towards the direction they’re travelling. The forehand can be very slightly ahead of the hindquarters. The purpose of this exercise in classical training is to develop the strength of the horses’ outside hind leg. In traditionally trained classical ground work (where the behaviours are formed through aversive application and it’s removal – negative reinforcement), the half pass arises directly out of practice and repetition of the two lateral exercises of Travers, otherwise known as haunches-in and Renvers, also known as haunches-out. The half pass is actually haunches-in across the diagonal. One of the reasons for this common myth for the systematic growth of the half pass out of the other two exercises is because it takes A LOT of repetition for the horse to learn to respond to the subtle threat signals which reliably occur before the ACTUAL aversive stimulus. Examples would be when the rein or whip aid is escalated to MAKE the hip move or the bend to occur. The horse will learn eventually through repetition to move his head or hip away when he experiences the predicting softer, lighter version of that rein or whip aid, which often goes on to become just the visual presence of the whip being held in a specific place. 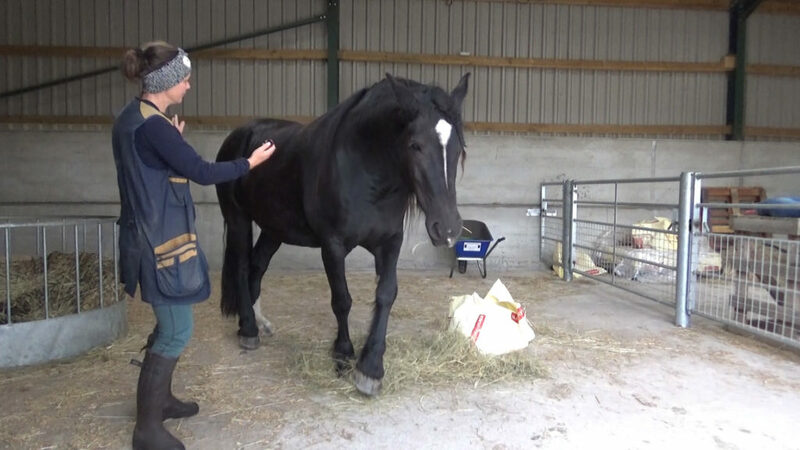 When training these same behaviours using positive reinforcement, the horse instead learns MUCH more quickly to respond to positively trained labels or cues prompting the behaviours. In the absence of a physical imbalance, endless repetition of a movement, which is often explained as a fundamental part of the classical in-hand process due to such complex movements requiring a gradual development in the horse’s balance and suppleness, actually just isn’t necessary at all. And on top of that, lots of repetition of the component exercises of travers and renvers arent necessary to produce the half pass this way either! Yes, of course there will be development within the actual end behaviour itself as the horse gains confidence in the movement, their own body and their body strengthens as a direct result of performing the movements themselves. But because of the way the component behaviours are taught to the horse using Straight & Supple, appetitive-based techniques, they learn to deeply explore the subtle micro-movements within their own bodies under their skin – they OWN their own movements. The repetition required so that they learn HOW to avoid the unpleasant aversive stimulus, and therefore reliably and smoothly produce the behaviour simply isn’t there. When we encourage our horses to figure things out for themselves in order to gain positive reinforcement rather than physically manipulating them into position with aversives and relying on the release of the aversive to motivate them to find that position again, we actually find that the horses become so much more deeply aware of their own bodies, their individual muscles and their physical anatomy and biomechanics. We help them to develop their own body and posture awareness. These movements are not necessarily something they would offer in such isolation in their day to day lives within a herd – a slight lift of a shoulder, or a compression of the joints on the one hind leg in order to sit their weight onto it, and even if they do, their conscious focus in that moment isn’t usually on which tiny muscle they contracted that then enabled that to connect through to be able to close the joints in that leg for example. Instead their focus is usually on the external stimulus which has prompted or caused that movement to occur – such as another horse getting too close to them, needing to turn to look at something across the field etc. This training really results in them having to explore inside their own bodies in order to be able to work out how to perform the movements themselves. The actual process of shaping their exploration and their tries as we grow them and move towards the end goal behaviours, using our bridge signal and appetitive rewards, develops their confidence and encourages them to delve deep into their own physical and conscious awareness, which also ultimately allows them to be able to show us any physical issues or pathologies they may have as well, since there is no force or coercion from aversives. And it also allows a behaviour to be formed MUCH quicker without months and months of repetition. This is my 6 year old horse performing some of her early steps of 100% aversive free half pass. She is responding to entirely positively trained cues. No physical aversives, such as reins or head equipment, have EVER been used during the training of these behaviours. This behaviour hasn’t been produced out of practicing the Renvers and Travers – instead this is advanced positive reinforcement training; the beginnings of conceptual adduction and the very first time I have EVER cued these two separate behaviours together. Conceptual Adduction is Ken Ramirez’s concept training – where the animal learns the concept of doing two or more behaviours together. Join us inside The Academy as Member today to start exploring the wonder of this incredible training!